A CURE FOR ALL DISEASES proves to be a rabble-rousing return to the fray for Dalziel, though it is a novel that should be approached with caution if you like your murder mysteries told conventionally. There are three main strands to the book. There's standard third-person narrative, yes, but there's a lot else too: large parts are told from Dalziel's first-person perspective, as he dictates a diary into a Dictaphone provided by his doctor (these sections are hugely enjoyable, but I still can't really see it happening). The remaining parts consist of emails from Charlotte Heywood (a recently graduated psychologist who has been persuaded to cast a scientifically-biased eye over the therapies that go on) to her sister, relating everything that goes on in the town and the things she notices. And it's these that are the problematic ones. Heywood is in a brilliant position to witness events that are crucial to the story, or could be, and Hill uses this excellently. However, I suspect many people (and a brief peruse of amazon confirms this) will not find these emails easygoing, especially Hill's core readership. They are written as genuine informal emails are - without such things as apostrophes, much regard for grammar, spelling, etc. They are not, let us say, a form of writing that's very easy to read, or get used to, if you don't use it yourself. Even I found them a little excessive at times, though for their length more than anything else, and the fact that I so enjoy the other two styles. The use of emails is not exactly new (as any reader of Minette Walters will know), but to include any in the style of these in a novel is a bold move indeed. And Hill does use them to illustrate the character of Charlotte Heywood brilliantly. Apart from that, and the fact that it's admittedly a little long, A CURE FOR ALL DISEASES is first class. Hill's style out of the emails is as entertaining as ever, his characters as engaging as ever, his plotting as exemplary as ever. And there's such social depth to it all. The novel begins with a dedication to Janeites (Austen fans), and with an epigram from Sanditon, her unfinished novel. The text that follows is clearly heavily influenced by Austen and her unfinished novel (I haven't read it, but even from a glance at wikipedia I can see parallels). The social aspects of the novel, the depth of the townly and familial relations, the three suitors who catch Heywood's eye (even if one of them is Franny Roote, here making his finest appearance in a Hill novel), all of it is Austenesque. And that may contribute to why it sometimes feels a little overlong (no offence to Austen fans, of course!) Many of Hill's novels are influenced by different dusty corners of the literary world: ARMS AND THE WOMEN by Greek and Roman poetry, DEATH'S JEST BOOK by T.L. Beddoes, DIALOGUES OF THE DEAD by the Lucian dialogues, and GOOD MORNING, MIDNIGHT by Emily Dickinson. In fact, if I recall, Austen has popped up before in PICTURES OF PERFECTION. Hill is clearly a huge fan, and this latest entry is perhaps his most accomplished appreciation yet, certainly it is the fullest in scope. One senses a labour of love. So, to sum up: mostly brilliant. The matriarchal Daphne Denham is a great character, as are most of them rest of them, but she stands out. Dalziel is on supremely entertaining form, and his convalescent musings are often hilarious. There are times when I was starting to think it was overlong and had better have a darn good end, and indeed it does! The mystery aspects of the plot are perhaps as fine as Hill has ever done. It would be difficult to recommend it unreservedly, because it is definitely the case that some readers will find the emails very hard going. However, you get used to them, and towards the last half of the book they do start petering out. 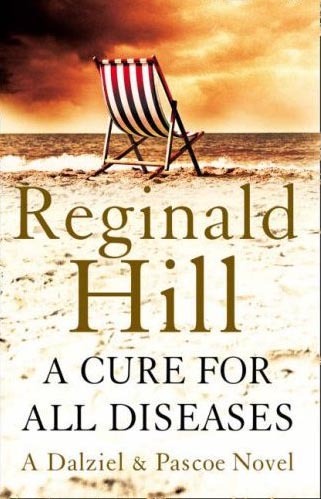 What you're left with is a very fine novel, full of everything we love reading Reginald Hill for, that is well-worth your while persevering with.